In arguing for a bigger slice of the state’s funding pie, Iowa’s public universities have painted themselves as economic engines that launch companies, create jobs, generate resources for scientific exploration and monetize research. A new Board of Regents report backs that up, showing Iowa companies in the 2017 budget year generated $14.1 million in revenue as a “direct result” of research on the campuses. That was up 47 percent over the $9.56 million in the 2016 budget year. But both figures likely are underrepresented as much of the revenue becomes too costly to track after licenses and patents expire, said Michael Crum, vice president for economic development and business engagement at Iowa State University. Numbers the universities can more easily track include new companies in research parks and incubators, which nearly doubled from 35 in 2016 to 66 in 2017. 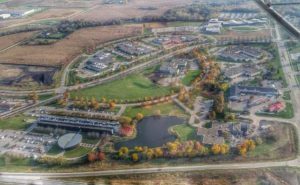 The 3,493 people employed at 185 companies in the ISU, University of Iowa and University of Northern Iowa research parks is up slightly from 3,460 in 2016. The universities formed a total of 29 startup companies in 2017, 21 of which were in Iowa. Those figures are on par with last year but above the 19 total and 15 in Iowa two years ago. University-related licensed technology and patents can generate revenue for the institutions — which have been scrambling to absorb millions in state cuts. The regent universities in 2017 reported $5 million in royalties and license fee income, up slightly from the $4.9 million mark in each of the last two years. But administrators at the UI and ISU have said commercializing discoveries is not a silver bullet to funding woes — as revenue from such endeavors is unpredictable. Illustrating that inconsistency is the 2017 intellectual property disclosures from employees, and patent applications and awards. In total, the universities tallied 234 intellectual property disclosures, compared with 304 in 2016, and 203 patent applications, down from 348 in 2016. “You probably would want to really look at it over a five-to-10-year period,” he said. Nonetheless, administrators are optimistic about the potential for developing breakthroughs. On the UI campus, officials highlighted several relatively new initiatives like Protostudios, a “rapid-prototyping facility” that helps researchers “develop fully functional prototypes of product ideas;” the Translational Research Incubator in the medical laboratories that serves as a lab counterpart to Protostudios; and UI Ventures, focused on helping university inventors launch ventures based on their research. Monday, the UI announced a new $1.4 million biomedical engineering lab with “cutting-edge tools and technology for creating and testing medical innovations” is available for student and faculty use. The lab was made possible by a $819,786 grant from the Roy J. Carver Charitable Trust grant. In the UI Research Park, more than 1,700 are employed. At the ISU Research Park, about 1,855 are employed. Although UNI is not a top research institution, it reported at least $3.7 million in revenue to Iowa companies as a result of its licensed technology in the last budget. Read the full article at thegazette.com.